For that extra special occasion, bigger is so much better! These beautiful and fresh flowers are thoughtfully arranged within personalised gatefold greetings cards to make for a seriously lavish gesture. 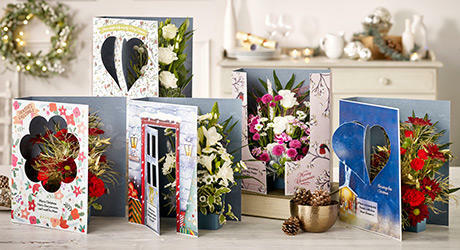 At approximately 22cmW x 28cmH x 7.5cmD, they are 100% bigger than our standard cards so the ultimate luxury to receive! All gifts with a Christmas tree icon beside them have been designed especially for the festive season. Enjoy browsing!